Most expensive purchase: Prescription food and medicines for my kitty, totaling just shy of $70. She’s lucky she’s damn cute. Least expensive purchase: A jambalya soup mix from World Market for $4.04. Can’t wait to make it! Most exciting purchase: A really big, nice salad bowl from Marshall’s Home Goods for only $7.99. Now it will be easy to make nice salads. Least exciting purchase: A tank of gas. $38.09. Blah. 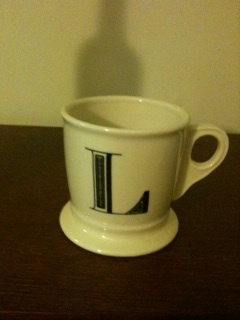 Most fun purchase: This cute L mug from the new Anthropologie in my neighborhood. It was only $6. If you knew the depths of my Anthro obsession, you would be proud of my restraint. Do you like the wine bottle shadow in the background? Least fun purchase: TurboTax fees, totaling $55.97. Double blah. Final verdict:This was a pretty spend-y week, but I’m happy with what I came away with. This was fun to write! Give it a try!